Embassy National Bank has one branch located at 1817 North Brown Road, Lawrenceville, GA 30043. They offer their customers unlimited ATM transactions at any ATM nationwide at no cost. Their offerings include business checking and savings accounts as well as SBA and other business loans. They are rated 4 stars on Google and 2.3 stars on Facebook. 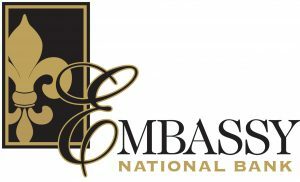 Embassy National Bank has one branch located at 1817 North Brown Road, Lawrenceville, GA 30043. Their customers may also access their funds at any ATM nationwide at no cost. You can use their contact us page to see their hours of operation. Embassy National Bank also offers the following business services: business savings and money market accounts, business and SBA loans, business lines of credit, and commercial real estate financing. They currently do not offer business credit cards and wealth management. Find out more about their small business offerings on their website.